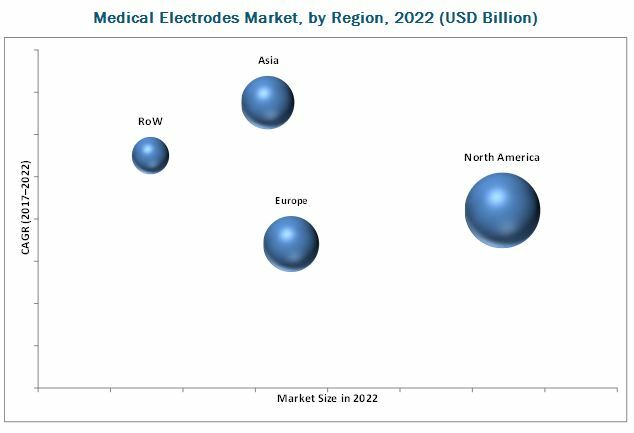 [147 Pages Report] The diagnostic medical electrodes market was valued at USD 560.8 Million in 2016 and is projected to reach USD 732.4 Million by 2022, at a CAGR of 4.7%. The study estimates the medical electrodes market size for 2017 and projects its demand till 2022. In the primary research process, various sources from both demand side and supply side were interviewed to obtain qualitative and quantitative information of the report. Primary sources from the demand side include various industry CEOs, vice presidents, marketing directors, technology and innovation directors, and related key executives from the various players in the global market. Primary sources from the demand include hospitals, diagnostic centers, and research centers. For market estimation process both top-down and bottom-up approaches were used to estimate and validate the market size of the market as well as to estimate the market size of various other dependent submarkets. All possible parameters that affect the Medical Electrodes market covered in this research study have been accounted for, viewed in extensive detail, verified through primary research, and analyzed to get the final quantitative and qualitative data. This data is consolidated and added to detailed inputs and analysis from MarketsandMarkets and presented in this report. The Medical Electrodes market is highly competitive with the presence of various players. Some of the major players operating in the market are 3M Company (US), Medtronic (Ireland), Ambu (US), Natus Medical Incorporated (US), Rhythmlink International, LLC (US), Koninklijke Philips N.V. (Netherlands), Cognionics, Inc. (US), CONMED Corporation (US), Leonhard Lang GmbH (acquired by DCC plc), and Nihon Kohden Corporation (Japan). The following customization options are available for this report. A number of factors such as rising incidence and prevalence of neurological and cardiovascular disorders, increasing investments in medical device research, and growing preference for home and ambulatory healthcare are driving the growth of market. In addition, emerging markets such as China, India, and Brazil are expected to offer significant growth opportunities for players operating in the market. 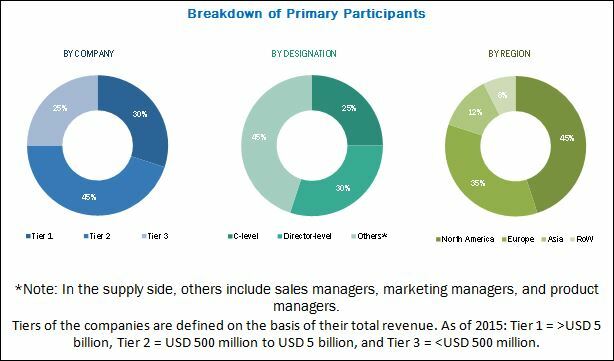 This report segments the market is segmented based on usability, technology, diagnostic procedure, application, and region. Based on usability, the Medical Electrodes market is segmented into disposable and reusable electrodes. The disposable electrodes segment is expected to account for the largest market share in 2016. On the basis of technology, the market is further divided into wet electrodes, dry electrodes, and needle electrodes. The dry electrodes segment is expected to register the highest CAGR during the forecast period. Dry electrodes offer higher patient comfort, and this segment is witnessing numerous technological advancements focused towards developing products that provide high signal quality and better patient comfort. These factors are driving its growth in the market. Based on the diagnostic procedures the market is segmented into electrocardiography (ECG), electroencephalography (EEG), electromyography (EMG), and other procedures [electroretinography (ERG) and electrooculography (EOG)]. Electrocardiography dominated the Medical Electrodes market in 2016 and to grow at highest CAGR during the forecast period. 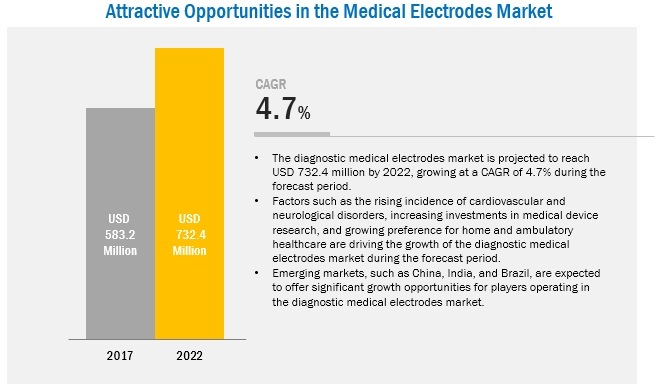 The rising prevalence of CVD, increasing incidence of arrhythmias, and technological advancements in ECG electrodes are the major factors supporting the growth of the diagnostic market for ECG. On the basis of application, the market is further segmented into cardiology, neurophysiology, sleep disorders, intraoperative monitoring, and other applications. The cardiology segment is expected to witness the highest growth in the forecast period. The large share of this segment can primarily be attributed to factors such as the increasing prevalence of cardiovascular diseases (CVD), growing geriatric population, rising cardiovascular health awareness, and technological innovations in diagnostics tools and monitoring techniques. In 2017, North America is expected to dominate the Medical Electrodes market. Factors such as growing focus on innovative technologies, rising geriatric population, and increasing awareness about the benefits of early disease diagnosis and high healthcare expenditure in the US and Canada are the major factors supporting the growth of market. *Details on Overview, Strength of Product Portfolio, Business Strategy Excellence, Recent Developments, Key Relationships Might Not Be Captured in Case of Unlisted Companies.